Referring back to Flattening Traditional Oilstones on 15th Nov 07, here is a picture of the rounding or bellying of a chisel back, caused by many years sharpening on a hollow oilstone. 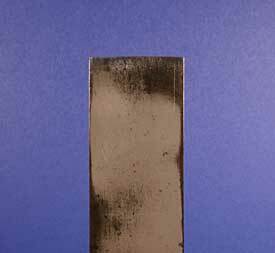 The dull gey area is the flat surface created on an 800 grit Japanese waterstone. Now this chislel will not sharpen or function properly untill the flat area extends all the way to the tip, so there is a lot more metal to be removed. Not only were the oilstones used not flat, it seems they might have been twisted as well. This is one of the main hidden dangers of buying old abused tools, it is difficult to assess the amount of work needed to restore a flat back without careful checking. I think it will be well worth the effort in this case as the chisel is a nice, bevelled edge, 1 1/4″ Pattern Maker’s long paring chisel, stamped Woodcock, Sheffield 1944. The usable blade is 7″ long, tool 14 1/2″ including handle. The other crucial detail is that over its full length, the blade was clearly forged and ground with about 0.5mm of hollow in its length. A most desireable and essential feature, deliberately created to aid preparation, sharpening and correct support for the cutting edge. So please remember to send those bellied new chisels straight back to the manufacturer if you are unlucky enough to come across them. The rounding off near the tip suggests a less than meticulous craftsman……. I will post more pictures as the work progresses. There are still a few places for my short courses in January and February, if you would like to experience the revelation of working with properly fettled and sharpened tools! 28th Jan in particular.